Hollywood, Behind The Scenes with Henley, is a behind the scenes glimpse of the inner workings of my character, Henley, as well as a sampling of my three years in the MFA Illustration program at the Fashion Institute of Technology. Henley is the story of a little dog that travels alongside his flamboyant adoptive owner, Ms. Lulu, learning life’s important lessons. Henley, In Hollywood, due to be published in 2015, the third book in the series, continues Henley’s adventures this time in Tinsel Town, where he learns that the trappings of fame and fortune are not nearly as valuable as just being yourself. The objective for me is to follow in the footsteps of a particular lost genre of illustrated books that I not only loved but also found inspirational through their unique and clever forms of visual storytelling. The concept behind Henley is two-fold. The primary focus is to tell the story as it naturally evolves, working on both the writing and illustrations simultaneously, creating an imaginative and sophisticated story whose appeal transcends all ages. The second part of the concept deals with the relationship between illustration and design, always an integral part of my work and the focus of my thesis, Designer Illustrator, A 1950’s Hybrid. The goal for my project is to creatively tell the story of Henley, In Hollywood, following in the footsteps of the Designer Illustrator, with vivid illustrations and interactive elements combined with a clever use of design. Come into this story with me, making imaginary things seem real and real things seem imaginary. For me the aspiration is to create a magical story, if only in your mind. This book is a coordinating element to CHROMA, Class of 2014 Visual Thesis Exhibition at The Museum at FIT, June 6-July 7, 2014. Finally I get this ebook, thanks for all these HOLLYWOOD, Behind The Scenes With Henley I can get now! HOLLYWOOD, Behind The Scenes With Henley was the best books I ever buy. HOLLYWOOD, Behind The Scenes With Henley did exactly what you said it does. I will recommend you to my colleagues. 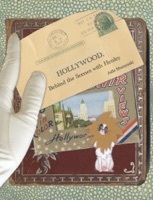 HOLLYWOOD, Behind The Scenes With Henley is the most valuable books we have EVER purchased. I'd be lost without this. I am completely blown away.